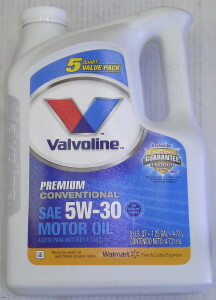 It’s pretty well known that engine oil with a higher rated viscosity tends to rob power from the flywheel end of the engine. It’s this mentality that has the new car manufacturers using lighter weight engine oils in which to increase the fuel efficiency of their engines as well as pick up some additional power. 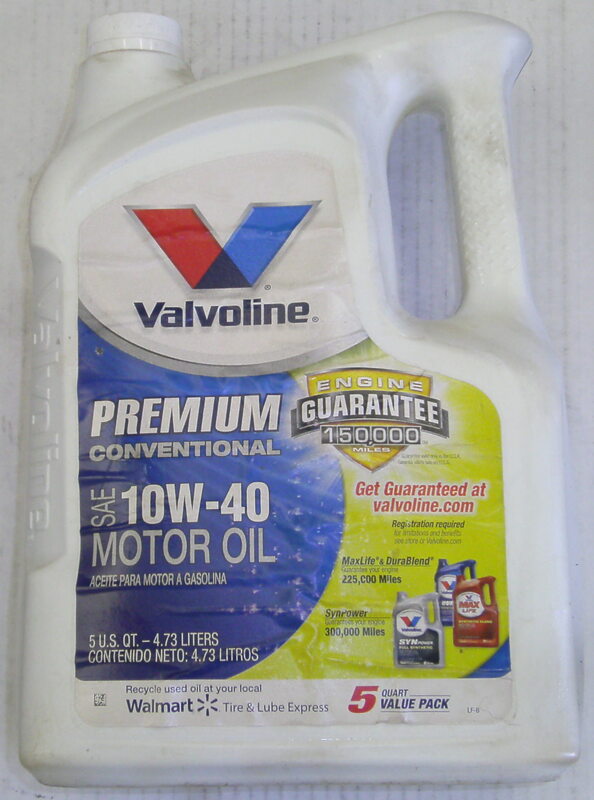 The oil itself is not so much the power robber as is the oil pump and clearances which simply makes the pump work harder to move a higher viscosity oil throughout an engine. Higher or heavier viscosity oil drives up the oil pressure which in turn makes the oil pump work against a higher resistance. In this vein of thought, the oil pump is ultimately just another horsepower robbing accessory similar to the alternator or water pump. In the case of the oil pump, using lower viscosity oil allows it to turn easier which simply frees up some horsepower. In some racing venues, the volume of oil delivered by the oil pump is intentionally reduced with an oil pump rotor size reduction to minimize the horsepower losses associated with an oil pump that’s simply larger than it needs to be. OEM oil pumps are generally engineered on the ‘large’ side of specifications to insure adequate oil flow under a variety of conditions and to also compensate for a given amount of long term wear within an engine. While dyno testing a high horsepower Ford Y-Block engine (570+HP), a significant drop in the peak horsepower numbers was noted when the oil was changed out for one with a higher rated viscosity. That particular engine had been initially started up and broken in with conventional 10W-40 oil. 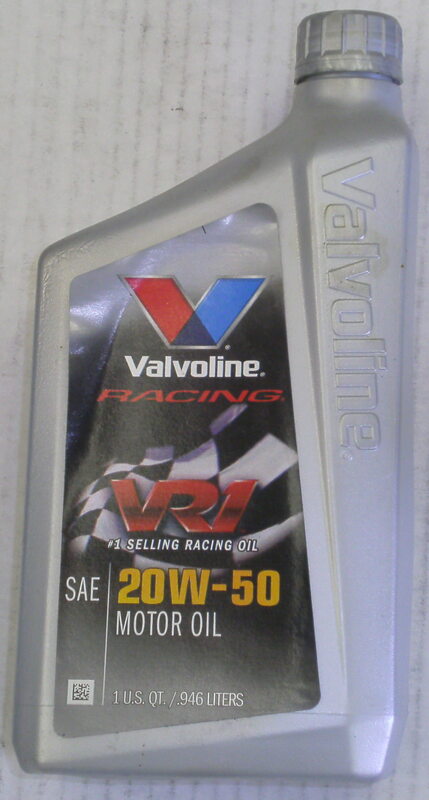 At the conclusion of that break-in and after making the prerequisite baseline dyno pulls, the oil was switched out to a 20W-50 racing oil at which point there was an immediate loss of ten horsepower. For both of these oils, the water and oil temperatures had been maintained within the same ranges which eliminated those two items as potential variables. While it was anticipated that there would be a horsepower loss with the higher viscosity oil, that loss being as much as ten horsepower was unexpected. It was this particular instance that would prompt a more complete dyno test using the 312 dyno mule where several different viscosities of oil would be run in a back to back fashion to clarify the effect on both the oil pressure and the power production. While the rated viscosity on the container is a quantifiable value that can be worked with, the unknowns in this series of test are the shear properties of the various oils. Based on the final results of the tests, there are some differences not accounted for in examining just the viscosity ratings. It can be assumed that some of these differences are related to the shear properties imparted within the various oils by the different additive packages used to derive the various viscosity ranges. 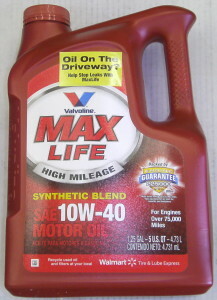 Another variable is the cycle time or how long the oil has been used within an engine. The first oil used in this test was well used versus the remainder of the oils being fresh out of the can bottle. The +060 over 312 dyno mule is prepped with a set of mildly ported ‘posted’ big letter G heads, a stock Mummert aluminum intake, and a 750cfm vacuum secondary Holley carburetor. 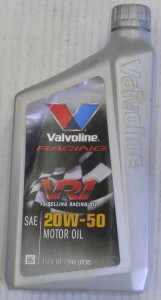 It is base-lined with the existing oil that’s already residing in the crankcase which is Valvoline conventional grade 10W-40. 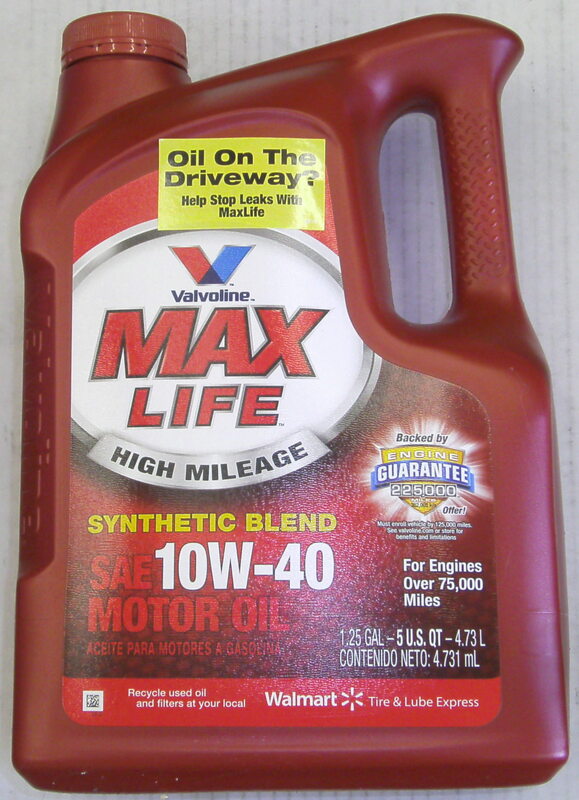 This particular oil is well used at this point and the engine is already past due for an oil change as the engine is fast approaching 300 dyno pulls with this oil. In fact, the oil pressure had been dropping off in the upper rpm range which was first thought to be bearing wear taking place. Six new dyno pulls are made on the engine with this oil in which to record data at varying engine coolant and oil temperatures. 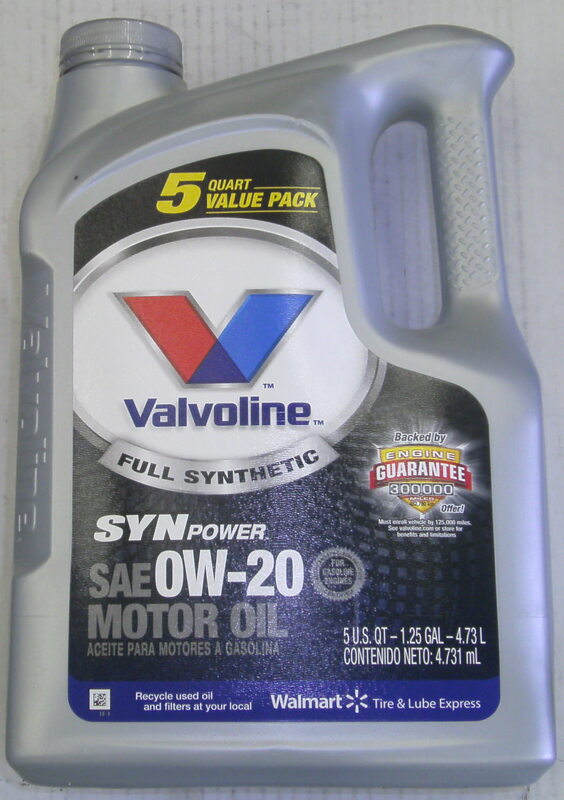 Once this oil was changed out with a 0W-20 full synthetic oil, all oil pressure issues went away which then indicated that the original oil in the engine was just simply ‘worn out’. 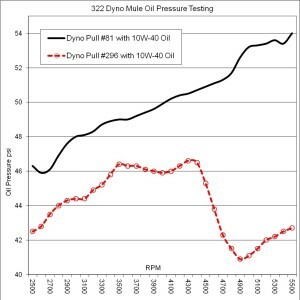 For this particular 10W-40 oil, a separate chart and graph is included showing how this oil performed over time as it was showing some serious degradation after dyno pull number 250. For comparision purposes though and because all horsepower numbers needs to be using the same cylinder heads, the baseline numbers for the first oil tested puts the average oil pressure at 44 psi and the peak horsepower at 310. 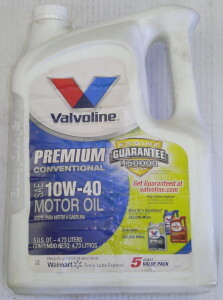 This oil was actually averaging well over 50 psi earlier in its life. To help maintain a level of consistency in the testing, the same brand of oil is used so that viscosity measurements are not as varied as would be if using different brands of oil. It has been found in the past that the viscosity measurements between oil brands within the same rated viscosity oils are not the same. While the baseline test would be the Valvoline conventional 10W-40 oil that was already in the engine, the other oils to test would include Valvoline 0W-20 full synthetic, Valvoline 5W-30 semi-synthetic, Valvoline 10W-40 Max Life (syn blend), and Valvoline 20W-50 VR1 racing oil. The oil filter is also changed with each oil change and the filter of choice for this test is the Motorcraft FL-1A. No additional additives are being used in this test although the zinc/phosphate amounts in the 0W-20 and 5W-30 oils are less than ideal for flat tappet camshafts. The zinc amounts in the remaining oils that are being used are more than adequate for flat tappet camshafts without the use of supplemental additives. I’ll add that at the conclusion of this test, there was absolutely no measureable wear to the valve train components although there were a number of dyno pulls made using oils with reduced amounts of ZDDP compounds. Here’s a chart showing the test results. Note 1. This particular oil was nearing 300 dyno pulls on it and looks to be ‘worn out’ by the time this oil test took place. The following chart shows the oil pressure performance of the 10W-40 conventional oil at the different rpms during the course of it being in the engine under a multitude of different testing conditions. Of particular interest is how the oil is not maintaining the oil pressure in the upper rpm ranges after ~250 dyno runs have been made using it. But to put more emphasis on what was going on with this oil, the following graph shows the oil pressure on runs #81 and #296 on the same oil. These two runs were selected simply due to the oil temperatures being the most similar. The degradation in oil pressure in the upper rpms becomes quite noticeable on the well used oil versus the same oil that did not have as many dyno pulls on it. 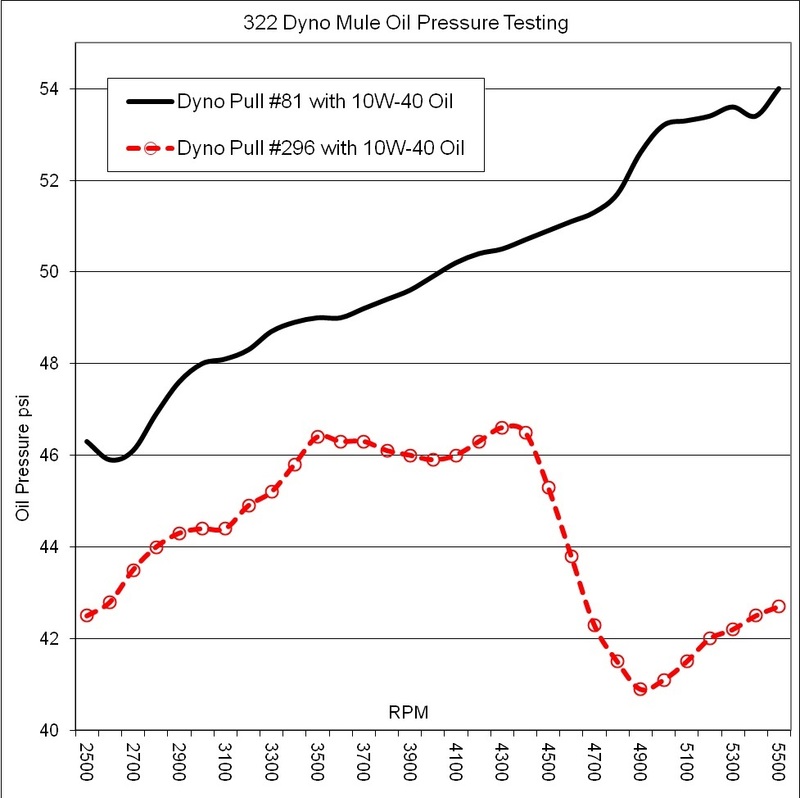 In summary, that same significant drop in horsepower that was originally seen on the high HP Y when switching from 10W-40 to 20W-50 was also seen on the dyno mule. While it was a 10 HP drop on the high HP Y, it was still an 8 HP drop on the dyno mule. For the remainder of the oils tested, the range or difference from best to worst was only 3½ HP which makes all those oils reasonably close to each other from a performance standpoint. In this particular test, the best bang for the buck comes from using the 10W-40 oil which already has the prerequisite amounts of ZDDP for the flat tappet camshafts without the use of additional additives. The Y engines with their flat tappet camshafts does still require an oil with a sufficient amount of ZDDP or an additive to supplement the known lack of it in the oil. Most API ‘SN’ rated oils with 40W or higher in their labeling will have sufficient amounts of zinc & phosphorus compounds for flat tappet camshafts while oils with 30W or less in their labeling do not. The surprise finding in this test was actually being able to see how the oil does indeed wear out or break down thus mandating an oil and filter change. This could very well be the results of contaminates that do not get filtered out. These contaminates then contribute to a reduced viscosity leading to cavitation issues not normally observed. A likely contributing factor is that this oil is being submitted to a multitude of full throttle power pulls which can put a more than normal amount of fuel past the rings and into the oil thus affecting the overall viscosity. If engine wear is to be minimized, then the oil and filter should be changed before the drop in oil pressure that was observed in these tests actually takes place. If I was to take a stab in the dark at how dyno pulls relate to real world vehicle mileage, then I’d say 250 dyno runs would equal ~3000 miles. Assuming the oil is not contaminated, then 250 dyno pulls on the same oil is the upper limit for this particular engine. More frequent oil changes sure will not hurt though. As always, just consider this food for thought. Until next time, Happy Y Motoring. Ted Eaton. Previous PostIntake Manifold Plenum SlotsNext PostStock Ford Y build or modified? Here are two different approaches.